Ouninpohja, Finland. A special stage so compellingly awesome that Colin McRaeeven named his racehorse after it. But recently, some very different types of horses tackled the heart-in-the-mouth crests that make this legendary Rally Finland road unique. On the one hand, the 318-horsepower Volkswagen Polo R WRC: a car that has won in Finland three times. Then, more unusually, the iconic Kamaz 4326 truck that is the undisputed King of the Dakar, with close to 1000-horsepower. On a narrow road in the middle of nowhere. Featuring an enormous jump. At the wheel of the Polo was ‘Flying Finn’ Jari-Matti Latvala: just like his car, a three-time Rally Finland winner. Close behind him in the Kamaz was Russia’s Ayrat Mardeev, who won the Dakar truck category in 2015 and claimed a podium finish on two further occasions. Most recently, he emerged with a truck win in the Silk Way Rally from Moscow to China last month. So a 10-tonne truck versus a one-tonne car, with a 16.5-litre diesel engine doing battle against a 1.6-litre turbo petrol. The inhabitants of Ouninpohja are of course used to encountering high-powered machinery screaming past their front doors: especially the occupants of the well-known Yellow House, which marks the launchpad for one of the biggest jumps in the sport. But they had never seen anything quite like this before – courtesy of two of Red Bull’s top offroad stars. Who remembers Stephen Spielberg’s famous 1971 film Duel, in which a car driven by an increasingly desperate Dennis Weaver is pursued by an avenging truck? 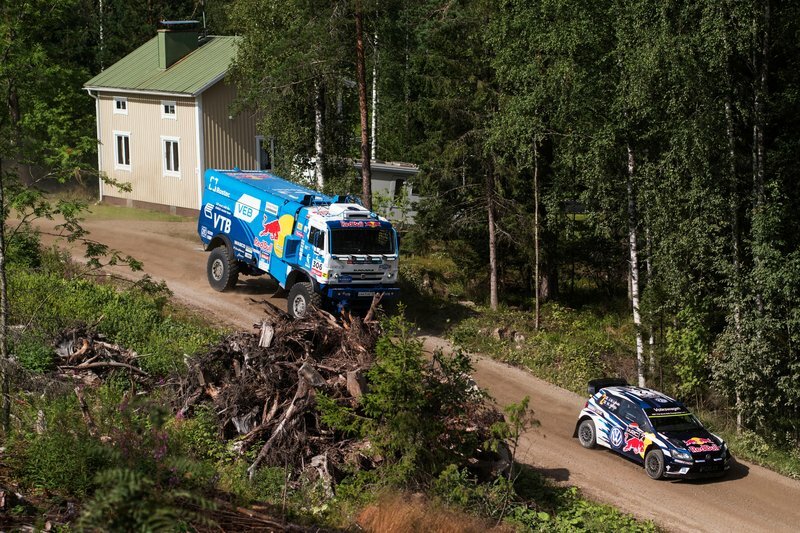 Well, Latvala and Mardeev just took that concept to a whole new level, with the Kamaz relentlessly hunting down the Volkswagen on the stage.